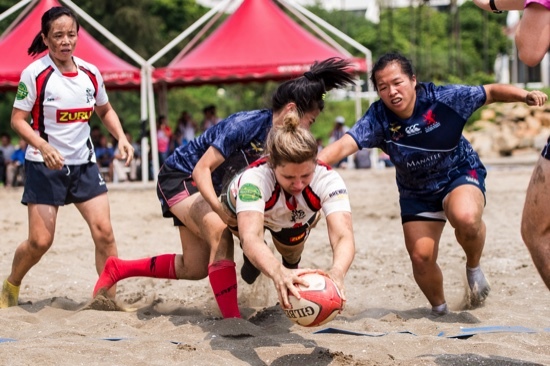 Hac-Sa Beach in Coloane has once again hosted its already traditional annual beach rugby event in Macau. Organized by the Macau Rugby Union, the 2015 edition of the Macau Beach Rugby Tournament was played on Saturday with a line-up of 14 teams competing for 4 trophies in both male and female competition draws. The home team took the kick-off as they faced the Taipei Baboons in the ladies’ tournament. This was one of the highlights of this year’s tournament, considering that it’s been a long time since a local ladies’ team was able to participate in this competition, which, according to the organizer Ricardo Pina, anticipates a “bright and positive future” in this sport. As for the competition, the Cotai Dealers, one of the local male teams, faced and defeated a team invited from Cambodia, taking a close win that was only decided in a overtime tiebreaker. In the men’s competition draw, Hong Kong’s University Unicorns 1 defeated the Shenzhen Dragons after a tiebreaker in a very intense game that saw three tries scored by each team. The Cotai Dealers relegated to second place the Phom Phen Minions, winning the men’s Plate Competition. The Best Male Player Award of the Tournament went to Julien Morel of the Shenzhen Dragons. For the female competition, the Taipei Baboons were crowned this year’s winners, showing great effort and skills in their victory against the Shenzhen Dragons Ladies. The Best Female Player Award went to Suzanne, also from the Shenzhen Dragons. In the Ladies’ Plate Competition, the Guangzhou Rams fought hard against the Hong Kong Police Sirens team but were not able to keep the pace against the stronger contender.